VLOOKUP function is one of the most popular functions in Microsoft Excel. It provides a quick way of looking up a value and retrieving specific data from a table or range. This step by step tutorial will assist all levels of Excel users in the usage and syntax of VLOOKUP function, as well as several applications to everyday work or tasks. 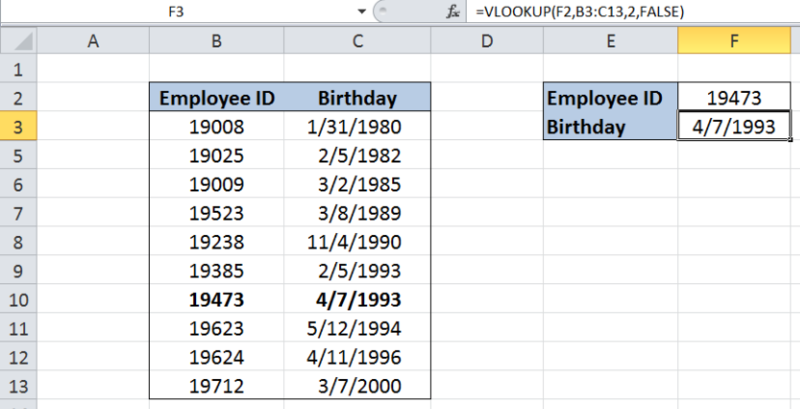 Suppose we have a list of employees and their birthdays, the quickest way to lookup the birthday given the employee ID is by using VLOOKUP. (What) in B3:C13 (Where) and obtain 2 (Column Number) using FALSE (Exact Match). The column number is 2 because birthday is in the second column of our table array B3:C13. As a result, we have found an exact match for Employee ID 19473 along column B, and moving to the second column to the right, obtains the birthday “4/7/1993”. In just a few seconds, we are able to obtain the birthday of an employee given the employee ID with VLOOKUP. Alternative methods would have been to go through the list one by one, or to filter the list to show employee ID 19473, both of which consumes precious time and are prone to errors. 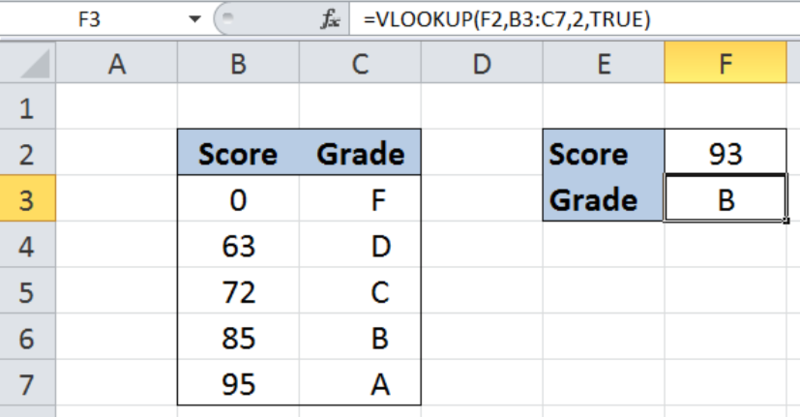 Suppose we are given a table with two columns: Cut-off Score (column B) and Grade (column C). We want to be able to quickly determine the equivalent grade for a given score. We can do this with VLOOKUP and using an approximate match. Our VLOOKUP formula searches for the score 95 along column B. Upon finding the score, it then moves to the second column to the right and obtains the grade “A”. 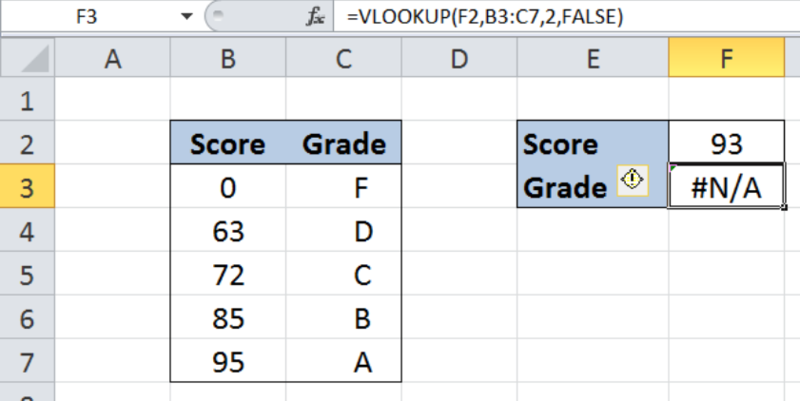 Finally, we are able to determine the equivalent grade for 95 using VLOOKUP. Using an approximate or closest match will allow us to obtain the grade for scores that are not listed in the table B3C8. Let us try and enter 93 into cell F2. When the formula doesn’t find the lookup_value in the table, it will look for the value closest to but less than the look-up value. In this case, our formula considered score 85 and returned the equivalent grade of B. Here we have two tables with two columns each. Table 1 contains “Name” and “Group” while Table 2 contains “Name” and “Color”. We want to merge the two tables and come up with a table with three columns: Name, Group and Color. 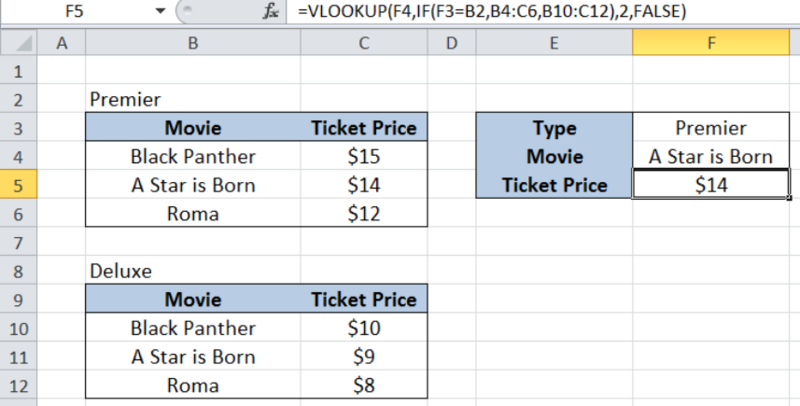 We can easily merge the two columns by using VLOOKUP with exact match. We have now successfully merged the two tables into one, as shown above in B2:D7. Suppose we have two tables with two columns each, Movie (column B) and Ticket Price (column C). Table 1 is for “Premier” tickets, while Table 2 is for “Deluxe”. In cells F3 and F4 we enter the criteria for Type and Movie. We want to lookup the movie in the appropriate table and obtain the ticket price. The value for Type will determine which table we will be using in the lookup. We can use a formula using VLOOKUP and the IF function. Our formula searches for “A Star is Born” in the table for “Premier”, B4:B6, and returns the corresponding ticket price of $14. The key here is by combining the VLOOKUP and IF functions. The IF evaluates the type and returns B4:B6 as the table_array if F3 is equal to B2 or “Premier”; otherwise, it returns B10:C12. The four examples we have learned are just a few of the applications of the VLOOKUP function. VLOOKUP offers a whole lot more, and it has the potential to improve productivity and data handling when mastered and applied everyday.